Mark Rothko (1903-1970) was one of the most prominent American artists of the postwar period. Considered an Abstract Expressionist, Rothko is best known for his color field paintings, where large masses of one or two colors fill the entire canvas. Before he began using that style Rothko explored many other forms of art and Sacrifice of Iphigenia exemplifies the artist's interest in Classical myth. Iphigenia was the eldest daughter of Agamemnon and Clytemnestra. Agamemnon gathered the Greek fleet in Aulis but no wind rose to sail them to Troy. Artemis prevented their departure in punishment for killing a sacred deer and to appease her Agamemnon had to sacrifice Iphigenia, if wished to sail on to Troy for his war that is. Of course Agamemnon chose to sacrifice his daughter, a decision that would later lead to his death at the hands of Clytemnestra who was told to send Iphigenia so that she could marry Achilles. 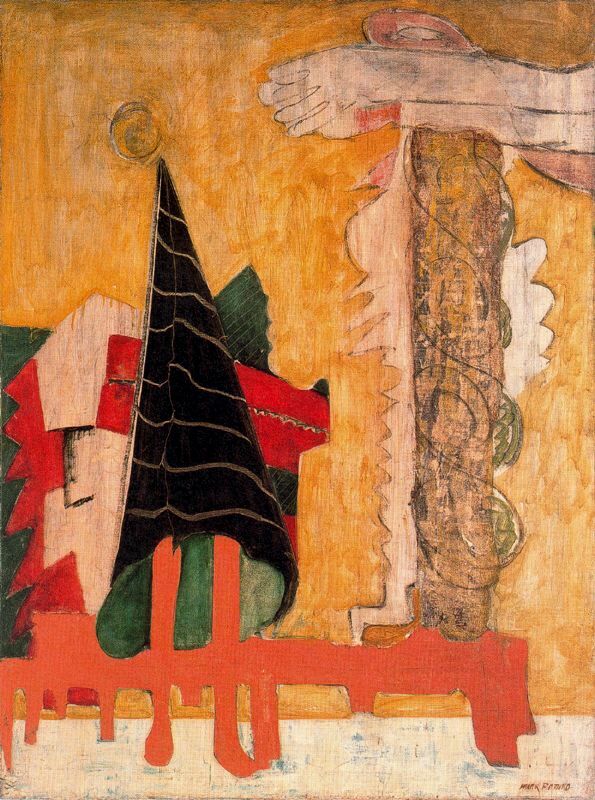 It is certainly possible to identify figurative referents in Rothko's piece; the black cone with white stripes would be Iphigenia's garment, and her moon-like face recoils from menacing hands that reach out toward her. Some have seen the figure on the right representing Clytemnestra, who is ripped open at the loss of her child. However, what was always important to Rothko was the spirit of the myth. While the story of Iphigenia has many implications, at its core it presents the willful death of a beloved innocent to perpetuate more killing. In the midst of World War II, Rothko was certainly thinking along these lines. Therefore he gives us a painting of deep pain and alienation. There is a harshness to these shapes, such as those hell-red jaws that Iphigenia seems to stand in front of. She wears a funerary shroud and her head is barely present, as her life fades away. The entire scene is backgrounded by this deep yellow color, that is perhaps warm, but definitely sickly. The extreme loss of life in these cataclysmic wars, such as the Trojan War and both World Wars, pervades this painting and tormented Rothko throughout his life. Thank you for filling in the mythology, the Iphigenia story has rich implications for all of us.